Kay’s test of courage begins when the housekeeper she is very attached to, Queenie, tells her that she will be leaving that night to live and work Brooklyn. 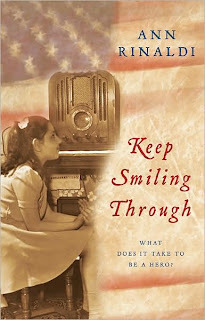 Queenie tells Kay to ‘keep smilin’ through’ and things will be ok. But they aren’t. The next morning Kay is told to pick up some eggs after school from scary Mrs. Leudloff. Mrs. Leudloff is German and Martin and Tom, Kay’s brothers, are convinced that she is a spy and her dog is a Nazi dog, because she has been heard listening to a short wave radio. Later, at school, Kay discovers that her best friend’s brother was lost at sea after his ship was torpedoed. Jen is now surrounded by the Golden Band, a group of the most popular girls who take Jen under their wing, even though they had previously considered Kay and Jen beneath them. In less than 24 hours, Kay has lost two friends, as well as her mittens and must now buy eggs from a German spy. But then Mrs. Leudloff is surprisingly nice to her and Kay likes her, which is good since Kay must buy the eggs from her throughout her lonely, otherwise friendless spring. That summer, Amazing Grace’s parents come to stay with the family. Kay is happy they are coming. Nana, who is Austrian, and Grandpa, a German, are very good to the kids even though Grace treats them no better than she does anyone else. One hot summer afternoon, Grandpa takes Kay to get ice cream from his friend Ernie. He tells her to stay at a picnic table and eat her ice cream until he returns and goes off to chat with Ernie. After a while, Kay goes to find him, and overhears Ernie and Grandpa talking about Hitler and the Third Reich. Then she sees Ernie give him a pamphlet from Germany. Before Grandpa can look at it, a group of men drive up. They shove Grandpa out of the way and go after Ernie, accusing him of being a Nazi and holding Bund rallies. When they hear Grandpa’s German accent, they turn on him, calling him a Hitler lover, pushing him to the ground and seriously injuring him. As they drive off, Kay memorizes the license plate on the car, then picks up and hides the pamphlet that Grandpa was holding. 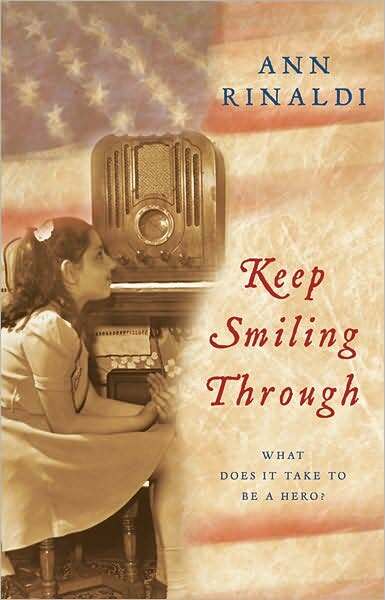 This is a well researched novel with lots of small everyday details that help give the reader the flavor of the time, showing how everything in life was directed at inspiring patriotism and loyalty, as well as the importance of radio heroes and popular music as ways of dealing with war anxiety. Rinaldi has cleverly centered Kay’s dilemma on the continued covert activities of the pro-Nazi German-American Bund, even though the Bund was outlawed in New Jersey in 1935. This was an interesting story; although at times I thought the story line became a little fuzzy in regards to the character of Amazing Grace. Nevertheless, it is definitely a worth while read.